Ouch! 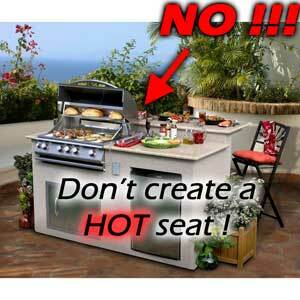 Don’t create a HOT SEAT by putting your guests right behind the grill. Where are your guests going to sit? That question could be expanded to “Where are your guests going to hang out.” You can pick the finest of grills, the most stunning combination of materials, colors, and appliances. But without a plan of where your guests are going to sit, your outdoor kitchen plan could be a huge disappointment. Think of the effort that goes into designing an interior kitchen. Usually the design process does not begin with the selection of the stove or cooktop, yet that seems to be the dominating factor in an outdoor kitchen plan. Most outdoor kitchens begin and end with the grill. Have you ever been to a party where the guests form a semi-circle around the stove inside the house? Probably not. So don’t try to make the grill the center of the entertainment area. Your friends will surely be impressed with the grill you buy, but that doesn’t mean they’ll want to spend the day looking at it. More thought should go into the seating area, the outdoor bar, and how your guests will socialize. If you look at outdoor kitchen pictures on various websites with this question, you will soon realize how silly many outdoor kitchen plans actually are. So many people build a virtual shrine to a grill, with bar seating right behind the grill. That is slightly more pleasant than hanging out behind a running car, but not by much! This piece of advice can be a budget saver too. Premium built-in gas grills are very expensive. You can save some money by getting a less expensive grill, perhaps a cart model grill, and putting it adjacent to your outdoor area, not in the heart of the plan. There is of course no right way and wrong way when planning your personal space. Ultimately, you the homeowner get to pick what makes the most sense for you. But be realistic when planning your outdoor living area. As impressed as you are with your grill, your guests may not be. They’ll enjoy your space more if you’ve planned some comfortable seating at a bar, or under the shade in comfortable chairs. If you plan it right, you’ll find that you have more fun in your outdoor living space enjoying time with your family and friends.